752 pages | 102 B/W Illus. Any supply chain improvement project, even if well conceived, has a good chance of failing, unless the accompanying information technology enables the design. Being prepared, understanding the risks and how to reduce them, will give you the edge you need. Combining a technology focus with practical advice, Making Supply Chain Management Work: Design, Implementation, Partnerships, Technology, and Profits gives you the tools to not only design new supply chains, but to design them effectively. 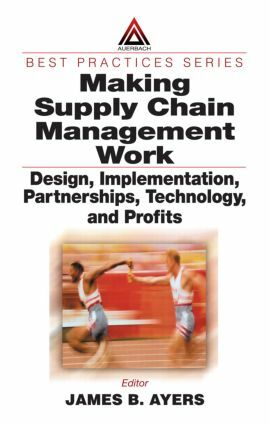 The book provides insights into the special requirements for improving supply chains, and consequently improving competitiveness. The chapters show you how to streamline the supply chain change implementation process, including systems changes, reducing the risk of wasting your time and money on an effort that is going nowhere in an area vital to the survival of your business. Making Supply Chain Management Work: Design, Implementation, Partnerships, Technology, and Profits highlights what can go wrong and more importantly, gives you the tools to make it go right. e-Factory Technology Solution Sets, A.N. Beavers, Jr.
Strategic Implications of Electronic Linkages, D. Young, H.H. Carr, and R.K. Rainer, Jr.
EUC Professionals as Change Agents, S.L. Stokes, Jr.
Data Warehousing Stages of Growth, H. Watson, T. Ariyachandra, and R.J. Matyska, Jr.